I'm a bit surprised from my US Visa. I plan to go to a conference on 3rd of April. Amazingly though, the visa expiration date is written as April 3rd. So what does that mean. Can I enter the US on April 3rd? or should I enter one day earlier? 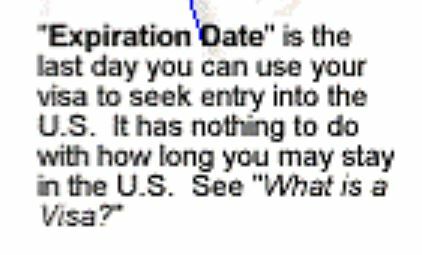 The wording of that webpage implies that you can, indeed, travel to a port of entry on the expiration date, April 3rd. Of course if your flight is a little bit delayed and you arrive on April 4th all bets are off! Although there is definitely ambiguity between 00:00 hours and 24:00 hours (ie start of first minute or end of last minute of the day) and I consider up to Tuesday to mean precisely on Monday or before visa authorities normally "play safe" (because of such ambiguity) and start and end dates are inclusive. In the insurance sector better consideration is given to this, for example 1/1/16 - 2/2/16 might have "bdi" appended, ie including both Jan 1 and Feb 2. Yes, the visa expiration date is the last day you can use that visa to apply to enter. Will there be any issue with re-entry to US with H1B visa set to expire in 4 months? Is leaving at 21:55 on the day before a B-1 visa expires considered overstaying?